A scammer is claiming to have raked in 200 BTC, about $812,000 at the time of writing, through “typosquatting” criminal dark web sites on the Tor network over the last four years, The Next Web reports. Typosquatting is a form of cybersquatting. It involves sitting on websites under someone else’s brand, targeting users who incorrectly type in a web address leading to the fake website. For example, typing in Faceboook.com instead of Facebook.com. The company responsible for the discovery of the scammer, Digital Shadows analyzed the evidence. However, they have stated that they can’t confirm whether the scammer made away with as much Bitcoin as he claimed. The scammer claims he self-made proxy payment software which he used on the websites and indicated that some form of purchasing had taken place. The scammer further claims that 800 domains were used. Digital Shadows confirms this is possible based on its analysis which found around 500 domains after searching several directories. Strategy and research analyst at the firm, Harrison van Riper first discovered the scam in November last year but ramped up the investigations after discovering it wasn’t an isolated incident. 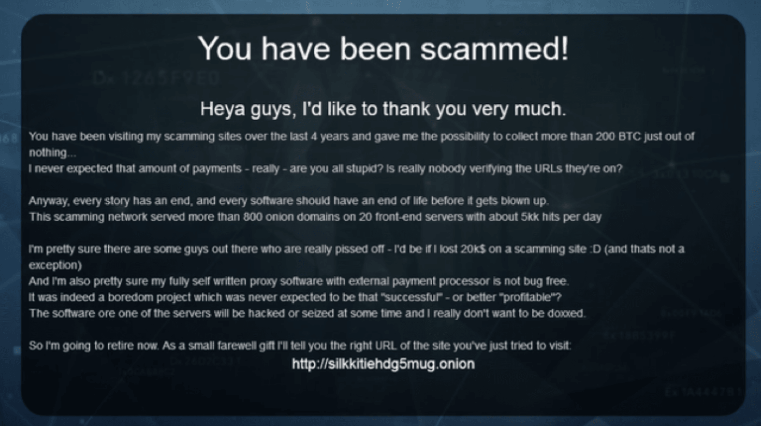 He eventually found over 350 legitimate .onion domains were being spoofed.